“A devilishly complicated phenomenon” gets straightforward, accessible treatment from journalist McCredie. 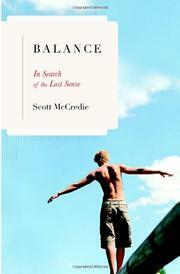 He became intrigued by the subject of balance, he writes, after witnessing his elderly father take a tumble. That drove him to investigate—and lucidly explain to the reader—how vision, proprioception (position-sensing) cells in muscles in joints and the vestibular apparatus of the inner ear are all involved in proper equilibrium. Motion sickness wasn’t a problem when humans walked the earth on foot, but vehicular travel (or even watching an IMAX screen) can lead to sensory confusion and nausea, so McCredie takes a close look at attempts to understand and treat “seasickness.” He enlivens his narrative with the personal stories of people who have lost their sense of balance through accident or illness and of those who have a highly developed sense of balance, like trapeze artists and acrobats. He also spotlights professionals who help people coping with balance deficits and researchers working to understand the mysteries of equilibrium. Looking at its evolutionary development, McCredie speculates that inferior balance control may have contributed to the demise of the Neanderthals. He uses the crash of John F. Kennedy, Jr.’s plane to demonstrate how relying on sensory information can be hazardous to pilots. NASA’s concern with the causes of what is called “space stupids” has stimulated research into the connection between the vestibular apparatus and cognition; McCredie includes a fascinating report on research into the effects of vestibular stimulation on such conditions as autism, attention deficit disorder and dyslexia. For those eager to retain this important sense, an appendix offers a series of exercises to assess, maintain and improve one’s sense of balance. Technical and scientific data conveyed with clarity; the consequences for individuals explored with engaging humanism: high marks all around.